Do you have slides, negatives or prints tucked away where no-one can see them? Pixels Plus provides high quality slide, film, and print scanning services. We can scan all film types using the latest scanning equipment. Scan them to CD or DVD! Custom high-end DVD slideshow authoring after scanning service. 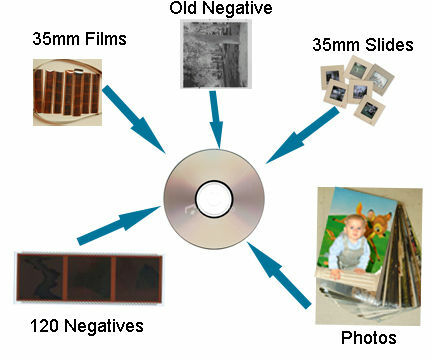 It's a fact that negatives and slides deteriorate over time and the means of printing, scanning & copying them in the future will not be available as photo lab machines will be entirely digital only, as it is already will the likes of Harvey Norman. You don't want to wait until it's too late and find out that your precious memories have faded away, do you? If you value your memories and want to preserve them the best option you have is film scanning. High-resolution scans are a great way to archive and preserve your history, because unlike film, digital files do not fade or color shift on their own. Files can be copied in a few mouse clicks and storage media is fairly inexpensive. This means copies can be easily made and stored in multiple locations. Simple storage is not the only benefit of having your film scanned, there are many advantages to bringing your film into the digital age. Once your slides and film have been scanned it can be restored to its original condition and even be improved. In most cases, colors can be brought back to life and fading restored. We do basic color corrections and fading restoration on all our scans free of charge. However, many of our clients want further adjustments to improve the color and composition of their photographs. People can be added or removed from your photographs, tears and scratches removed, color photographs can be transformed to beautiful black & white and b&w photos can be colorized. The possibilities are endless! All our scans are done individually by hand to ensure the highest level of quality possible. Materials are evaluated pre and post scan and adjustments are made if needed. Your materials are always handled professionally and with care, we know they are priceless to you. When we've completed scanning your negatives, slides, or prints we return your original materials along with the CD or DVD containing the film scans. Our scans are labeled numerically so you can order photo restorations or prints from Pixels Plus at a later time. If you order a CD or DVD they can be either in a data format or a slide show format.